Belated happy new year! It’s been an exciting time adjusting to life in the States. It’s been eye opening as I’ve engaged with the disability world here. Mainly, I’ve noticed that there is less of a disability movement in New York, compared to what I’m used to back home. Impairment groups mainly work for themselves, and there is a different undertaking of the social model. I feel that there is less collaboration, and more ‘out for yourself’ drive. This is just my experience, and there has been positives, I am involved with a centre for independent living here working on an access project. So, I am happy to be seeing the downloads being used, I am so happy to be in America and learning about our differences. Mostly I am so proud that God has a plan and use for all of us. We have been settling well into life in America, and have been loving the weather and the colours of fall. I’ve been really enjoying getting to know a local church and have been getting involved in a range of things very quickly. This has got me thinking about inclusion. The Open Praise Project has always focussed on being accessible and inclusive, but too often this has excluded us. The label of ‘for people with learning disabilities’ was our first exclusion. Our previous congregation would respond with ‘oh, your doing something for those disabled children’, the initial conclusion being that learning disability means children with special needs only. This not only excluded us from engaging the congregation effectively, but also highlighted the discrimination that adults with learning disabilities receive, often unintentionally. We found that the engaging nature of our work was quickly disregarded as ‘for children’. Whilst our work is open to, and great for children, we have always kept our work clear and simple, not childish. And yes, there is a difference! We ran sessions weekly and found that few of our congregation would come. The ones that did arrived ready to ‘help’ and ‘serve’. They were often handed a maraca and told to enjoy themselves! We found ourselves excluded from the church because of our inclusive nature. As soon as a project about disability arose, those who did not identify with that stepped back. We challenged this, highlighting that the open praise project is simply a different way of worshipping, and changed our info to ‘for people with and without learning disabilities’. We wanted, and have always developed our sessions as having something for everyone. One by one different congregation members would tentatively attend, and usually end uplifted and refreshed by their time of praise. One lady confided in me, ‘I didn’t think you were allowed to jump around in a church, it was such a expressive way to praise.’ We started to make a difference in the attitude of the church, but not enough to feel on the same page. Our inclusive and different approach was seen as great for those who didn’t fit in with Sunday morning but not visa versa. Currently I am in the USA and working on a new open praise project session. For members of the church I am attending here. None of them have learning disabilities. We will be spending 1 hour reading 2 Samuel 22 v1-21, and will be using fire, smoke, water, sparklers, party poppers and other trademark open praise project materials. Why? Because when we talk of Gods anger, I want to SEE it, when we think of his lifting us from the water I want to FEEL it. And other people do to. I struggle when people ask me who open praise project is for, my heart is about inclusion and accessibility and this mainly due to my experience with disability. But I don’t want to exclude the ‘mainstream’ through my inclusiveness. I don’t want the open praise project to be labelled, and it wont be.Unless the label is ‘awesome’. It’s beginning to be Christmas time again! and that means our ‘story of Jesus’ birthday’ craft and storytelling pack is back, we made 100 copies last year and have a bit of stock left, realised that sales to an American audience may be tricky as the sign language used is BSL not ASL! I am living in America for one year with my family, so am excited to explore the disability world here and see what similarities/differences there are. Already there is a lot of different language, handicapped still used on some signage, intellectual difficulties used rather than learning disability and ‘people with disabilities’ used. Looking forward to finding out more! Back from a surprisingly sunny Greenbelt Festival where we delivered our joint worship session. It went really well. Firstly, L’arche are so gifted at liturgy’s that they performed brilliantly, secondly the collaboration between these three groups really sparked creativity and positivity about future work. I introduced the session and loved seeing so many people getting involved. Feedback at the end was really special, ‘the best worship session i’ve been to’ ‘the best thing i’ve seen all Greenbelt’ It was really great stuff! Books of OPP sold well too, so a good year for us! Thankyou to all who took part. This week we have been mostly preparing for our L’arche and Faith and Light collaboration at Greenbelt Festival. Am really excited to be part of something special this year, and what an honour to be doing it with 2 such well known and established groups! We are delivering a worship session base on Jesus’ parable of the banquet. We will be bringing it to life with dressing up and acting it out. I think it will be a really exciting hour! 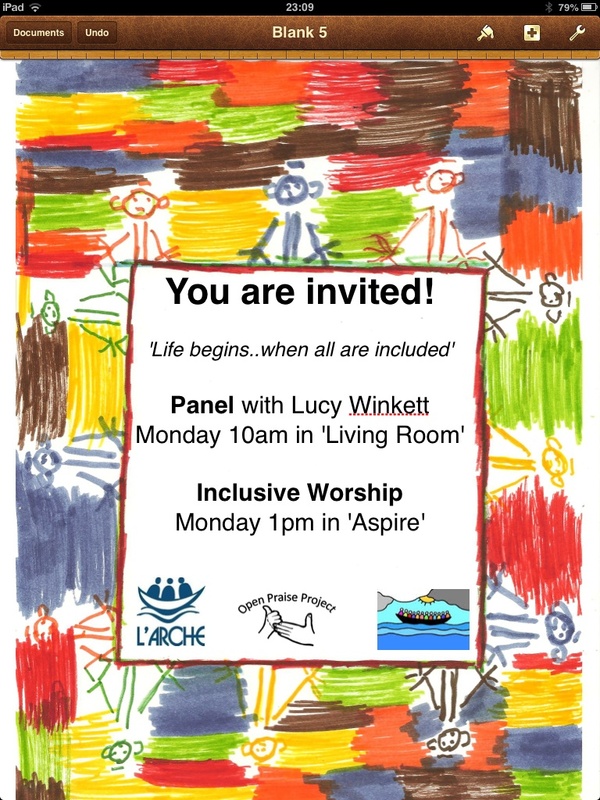 I have been working on some publicity posters to spread about the place with a picture drawn by Geoffrey from L’arche Kent. Given that these sort of sessions are natural to L’arche, who have been doing this at Greenbelt for some years, I felt that I wanted to contribute in true Open Praise Project fashion so I’ve made a small booklet of the story. Called The Feast, it is a small book which I hope people will enjoy. I really liked making it, and it has some of my favourite images that I’ve drawn. I think, apart from buying another tent after last years drowned, that I am ready for Greenbelt. I am really chuffed that it has been 2 years since they funded me £500 to get Open Praise Project off the ground and it seems to be doing just that. It’s been great reading about your work!